Gout is a form of arthritis caused due to inflammation usually affecting one joint. The most common symptom of this disease is severe pain in the joint that usually begins suddenly. It occurs due to the deposition of uric acid crystals in the joint tissues. Alternative Natural gout treatment using Indian herbal remedies recommended by Ayurveda can be highly beneficial for controlling joint pains and pathogenesis caused due this disease. Gout often involves the joints in the lower extremities, particularly the joint of the big toe. If not controlled properly, this disease can progress and affect several joints resulting in poly-articular gout. Gout may affect the smaller joints in the foot, and fingers and even the bigger joints like the knees, ankles, elbows and the wrists. A regular use effective gout remedies is highly recommended to keep the symptoms in control and prevent the involvement of multiple joints. 3. Warmth and tenderness of the joint. The joint pain is intense reflecting the severity of inflammation. The affected joint is sensitive to touch due to which the patients often complain of severe pain even when something just brushes against the joint area or when pulling a bedsheet over the affected joint. A natural gout relief using Indian herbs and following a healthy diet based on ayurvedic principles can help to minimize these symptoms and ease the life of patients by slowing down or even in some cases by reversing the pathogenesis. Formation of tophi is a characteristic sign of gout. It is a hard nodule formed of uric acid deposited under the skin. Tophi are usually found in the elbows, upper ear cartilage, sometimes in the kidneys. The presence of a tophus due to gout indicates a higher severity of this disease due to the substantially higher production of uric acid. Using an ayurveda herbal medicine for gout arthritis can be a safe and effective way to avoid these consequences and prevent the formation of painful tophi. It can also control the severity and duration of the illness. Gout is caused by the high levels of uric acid in the blood, which results in the formation of crystals that get deposited in different tissues of the body. Most often, these crystals are deposited in the joints and cause inflammation leading to pain, swelling and other symptoms. Uric acid is a natural by-product released during various metabolic processes in the body. It is produced when certain proteins known as purines (building blocks for RNA and DNA and are found in various quantities in all proteins) are broken down. Hence, ayurvedic treatments that are aimed at controlling the uric acid levels in the blood has been advised to prevent the development of this disease. Ayurvedic approach to gout cure is aimed at preventing the development and progress of this diseases by eliminating excess uric acid from the body and thus, protecting the joints against the damage caused by the deposition of crystals. The risk of gout is higher in the patients having a family history of this disease. Some other risk factors include obesity, side effects of medications like diuretics, and chronic renal dysfunction. Ayurveda has been offering the best remedy for gout that would regulate the production and release of uric acid during metabolic processes by regulating the breakdown of purines. When coupled with an ayurvedic diet, it can also help to reduce the risk of repeated attacks of gout in the future. The other risk factors for gout include dehydration and trauma. Diuretics, also called water pills, which are used to treat high blood pressure or edema, can raise the level of uric acid in the blood by stimulating the excretion of water from the kidneys. As a result, the concertation of uric acid in the blood increases resulting in the formation of crystals. The use of herbal natural supplements for gout can help to avoid these consequences by regulating the kidney functions and preventing higher concentrations of uric acid in the blood. Patients with gout in conventional medicine are usually treated symptomatically to relieve the joint pains. The commonly prescribed drugs for gout include NSAIDs or Non-Steroidal Anti-Inflammatory Drugs that only relieve the pain temporarily. These medications do not address the root cause, the high uric acid levels. Hence, the disease persists and the damage to the joint continues to worsen. Hence, patients are advised to use natural remedies for gout to derive long-term benefits. 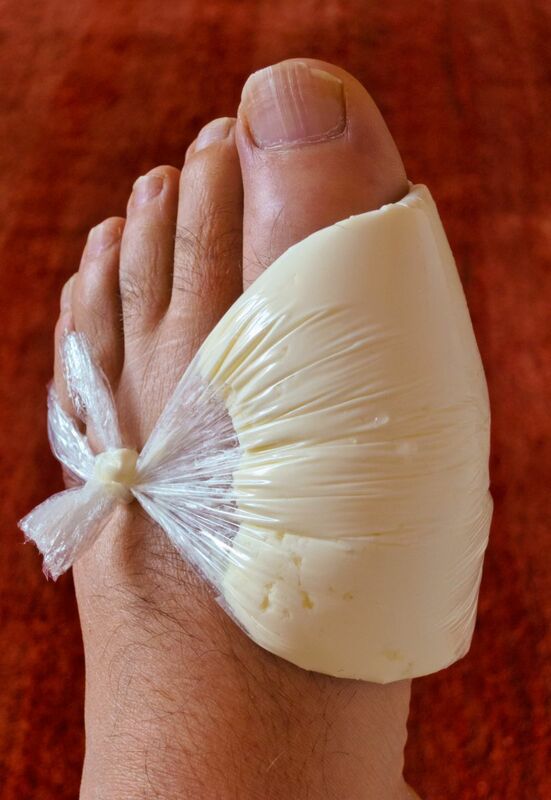 Ayurvedic treatment for gout in foot and other joints is aimed at regulating the metabolism to prevent high levels of uric acids and can be taken alone with western medications. Ayurvedic naturopath also recommends a diet to control the progress of the disease. A uric acid diet can prevent further damage to the joints and restore the structural and functional integrity of the affected tissues. The diet also contains foods that promote healing and inhibit inflammation and is devoid of foods high in uric acid. 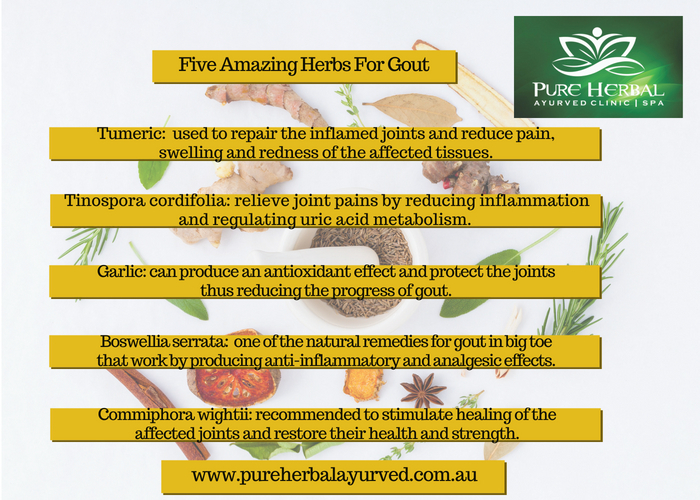 The use of herbs and ayurvedic natural products for gout can offer a safe and effective approach to obtain long-term relief from the symptoms of this disease. Patients can use the natural herbs for gout given below to prevent inflammation in the joints and inhibit the formation of uric acid crystals. Giloy (Tinospora cordifolia): Giloy is a natural medicine for gout that can relieve joint pains by reducing inflammation and regulating the metabolic processes involved in the release of excess uric acid. Garlic: Garlic can produce an antioxidant effect and protect the joints thus reducing the progress of gout. Shallaki (Boswellia serrata): Shallaki is one of the natural remedies for gout in big toe that work by producing anti-inflammatory and analgesic effects. Guggul (Commiphora wightii): The use of ayurvedic herbs like Guggul is recommended to stimulate healing of the affected joints and restore their health and strength. Haridra (Tumeric): Haridra can be used to repair the inflamed joints and reduce pain, swelling, and redness of the affected tissues. Shunthi (Ginger powder): Shunthi can be the best thing for gout pain that occurs suddenly. It can relieve the joint pains and also minimize the frequency of the episodes of this disease in the future. The best cure for gout as recommended by Ayurveda includes the use of herbs in combination with a ayurveda diet that prevents inflammation in the joints. A gout diet includes foods that possess natural medicinal properties, which prevent a high level of uric acid in the blood and protect the joints. This system of Indian medicine can help the patients live a stress-free life by preventing sudden attacks of severe joint pains.  Patients suffering from gout can approach (in person or online) the best ayurvedic clinic in Melbourne, Pure Herbal Ayurved Clinic, to obtain a long-lasting holistic relief. 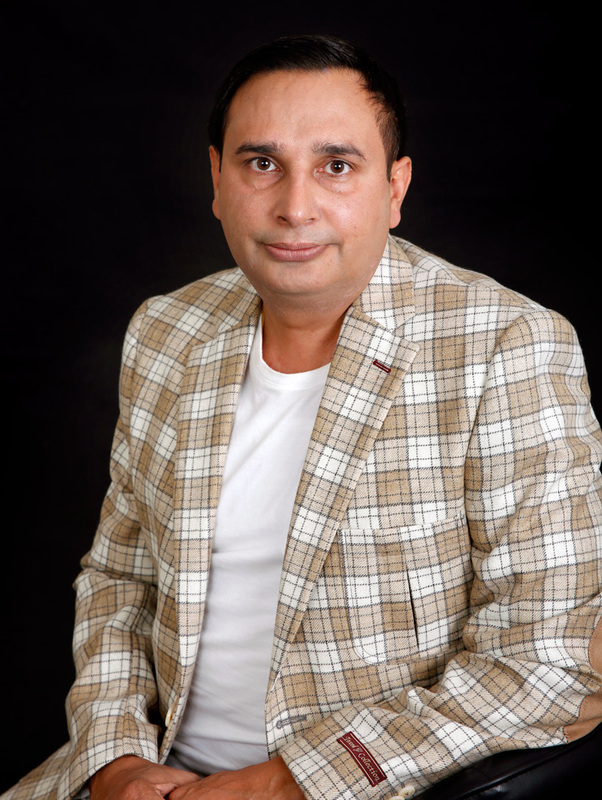 The holistic doctors at this Melbourne wellness centre can prescribe safe and effective Indian herbs that protect the joints and reduce inflammation. Ayurvedic doctor may recommend panchakarma detox to eliminate excess uric acid accumulated in the blood and joint spaces thus hastening recovery. The use of ayurvedic medicine in Australia can also help to ease the symptoms of this disease and allow the patients to lead a healthy life. Ayurvedic doctors at the natural medicine clinic provide a holistic treatment of gout that is aimed at relieving the symptoms and improving the joint mobility.